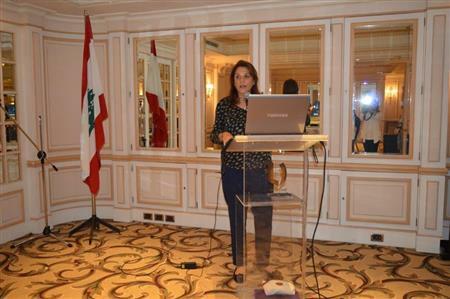 By Ms Raya Boustany Communication Specialist- Mediator & Harvard Master Negotiator. The session was also followed by the pinning of Mr. Colin Gibson and 4 Rotaractors. "Where is the Lebanese Economy heading to? 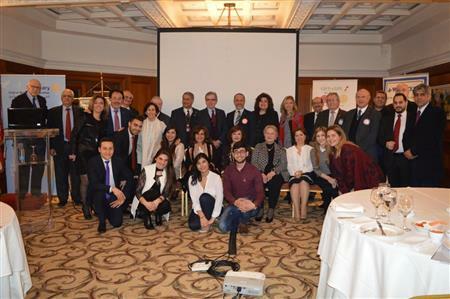 A Short Term Perspective"
"Reshaping Road Safety Education in Lebanon & Mena"
"Official Spanish Lebanese Relations & the Social Assistance from the Spanish Civil Society to the Needy in Lebanon"
Joint dinner between RC Beirut Cosmopolitan and RC de Beyrouth. H.E. 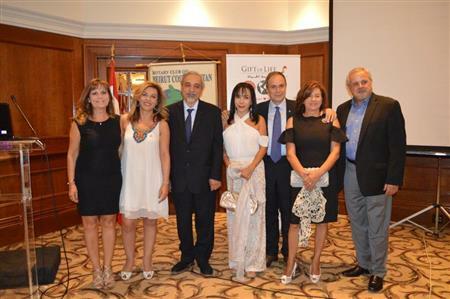 Jose Maria Ferre de la Pena Ambassador of Spain to Lebanon and his Spouse Mrs. Jumana Trad (President of Fondacion Promocion Social) were the guest speakers. 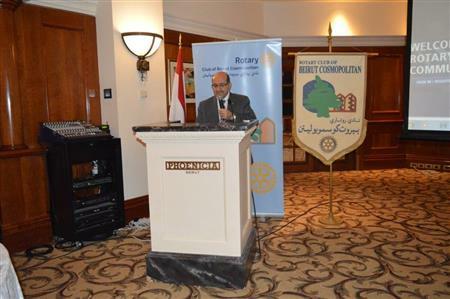 "Impact of RCBC donation of Braille Equipment on the Improvements in the School Program"
"A Fair Trade Wine in Lebanon"
"Impact of RCBC Donation on the AUBMC Dept of Ophtalmology & Patients"
"Official Documents from an Artist's Eye"
Rotarian PP Paul Edde informed RCBC about the history behind St Jude CCC, its objectives, challenges, and accomplishments. 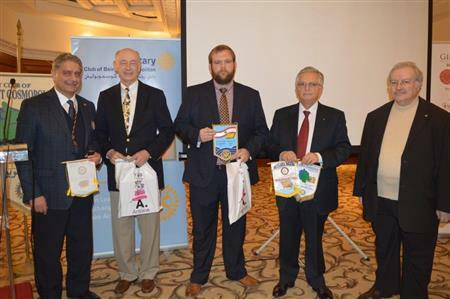 During the meeting RCBC welcomed Rotarians from District 1841 of which DG Hans Peter Sonnenborn. 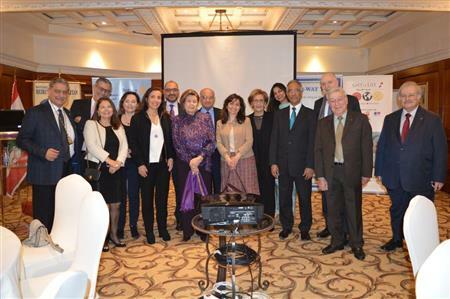 RCBC also celebrated the birthday of Rt Nada Maalouf, Farida Najjar and PP Habib Saba. "Fixing Life, How to Make Emotions Work for You"
by RCBC guest speaker Mr. Johnny el Ghoul Speaker, Author, Corporate Management and Sales Training Coach. "DG Michel Jazzar visit to RCBC"
RCBC was honored to receive DG Michel Jazzar and ADG. 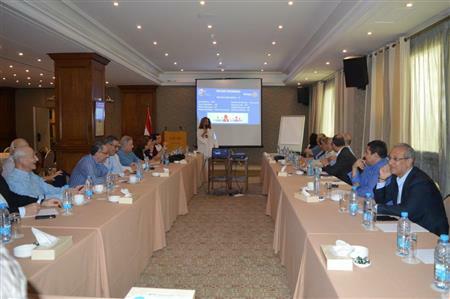 During the meeting, all committees chairpersons introduced their committees action plans and projects in the pipeline. DG Jazzar also discussed many points related to the District and his strategic action plan. "EU / Lebanon Relations- A Strategic Partnership"
An RCBC tradition, each time with more and more fun, costumes and prizes !! Lecture by Dr. Karim Najjar Associate Professor, Department of Architecture and Design AUB. 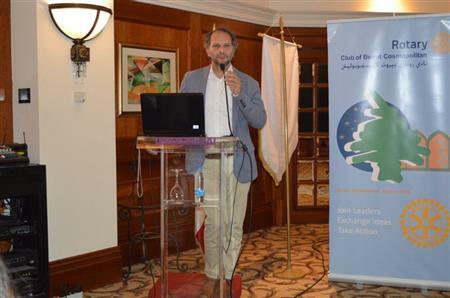 "Cedars Projects, Privatization and Road Forward"
Peace lectures by "Dr. Ghada Ayoub and Mr. Abbas Sibai"
RCBC speakers presented two speeches related to Peace. Dr. Ghada Ayoub's speech was about "Civic Education & Peace Building", as for Mr. Abbas Sibai, the speech was about "World Peace". 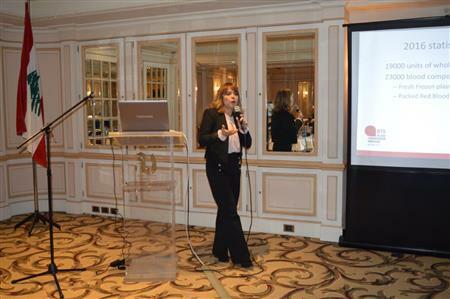 Mrs. Rosy Boulos, Director of the Lebanese Red Cross Emergency Services presented live demonstrations of First Aid and life saving techniques. Mrs. Boulos was also assisted by Red Cross paramedics. 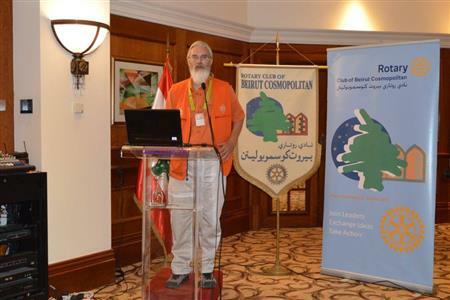 "Rugs of the Caucasus: Symbols and Realities"
By guest speaker Rotarian Aziz Bassoul of RC de Beyrouth . Dr. Bassoul is the Ex CFO and Ex CEO of CAT group of Companies and is the author of "Rugs of the Caucasus" and of " Human and Divine"
BCRAC members presented to RCBC members and guests the projects that were implemented during the RY 2017-2018. Dr. Jamal Itani mayor of the Beirut municipality talked about the projects that are being accomplished in Beirut as well as the futur projects that are being planned and the related challenges that the municipality is facing. 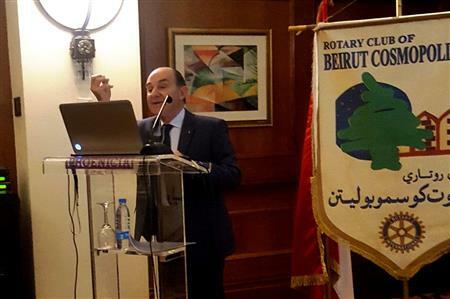 RCBC Rotarian Dr. Michel Mansour covered a very interesting topic "Understanding Menopause"
RCBC Rotarian Wael Hamdan - Head of the Finance Unit at BDL- presented to the RCBC members and guests the BDL incentives to the private sector. "Women's Empowerment in Lebanon: Myth vs. 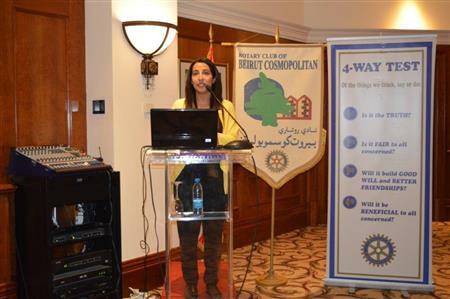 Reality"
RCBC Rotarian Rana Salhab (Partner at Deloitte in the Middle East) was the speaker at RCBC weekly business meeting. 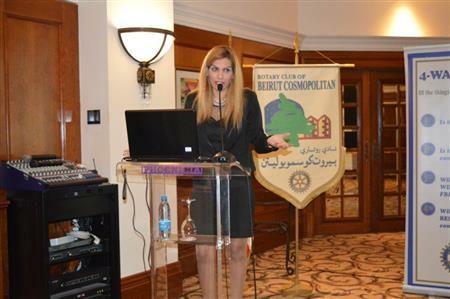 The title of the speech was "Women's Empowerment in Lebanon: Myth vs. 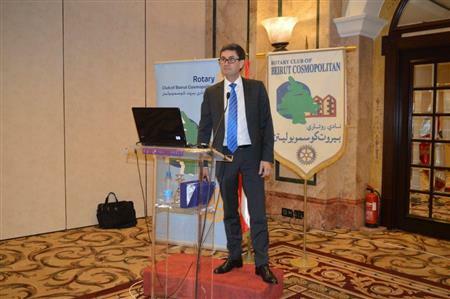 Reality"
Guest speaker was Rotarian Dr. Ghaleb Mahmasani who gave an in depth presentation about the Lebanese Electoral Law. "Water Challenges in Beirut by Dr. Fadel"
Business meeting with Dr. Mutasem al Fadel who spoke about Water Challenges in Beirut. "Business Meeting with Dr. Joyce Azam"
"Presidential Peace Conference Lebanon 2018"
Presidential Peace Conference. 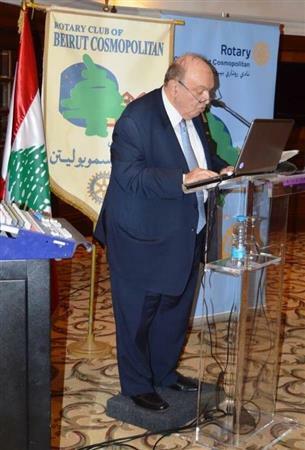 This conference was on “Water, Sanitation, Hygiene and Peace”under the auspices of the President of Lebanon General Michel Aoun, the President of Rotary International Ian H.S.Riseley and President of the Rotary Foundation Paul Natzel. General Assembly with our District Governor Christina Covotsou Patroclou. Nine members were pinned as Paul Harris Fellows. 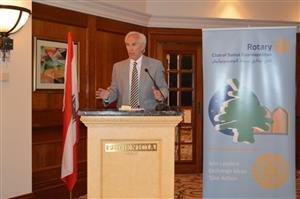 "Swiss-Lebanese Relations with H.E. Monika Schmutz Kirgoz"
Gala Dinner with Guest speaker Her Excellency Monika Schmutz Kirgöz who addressed the audience about the Swiss Lebanese relations. January 30 Business meeting with guest speaker Mrs. Rita Rassie . The topic was Personality Disorders. 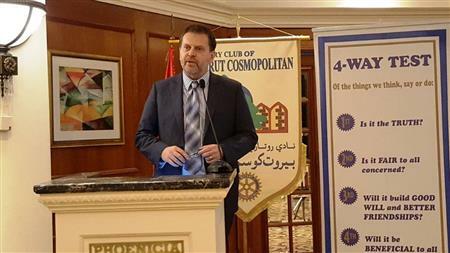 "The Rotary Foundation by PP George Beirouti"
January 23 Business meeting with PP George Beyrouti. The meeting was a club information session about Global Grants. "Economic Development 2017-2018: Highlights and Outlook" by HE Raya Haffar El Hassan. 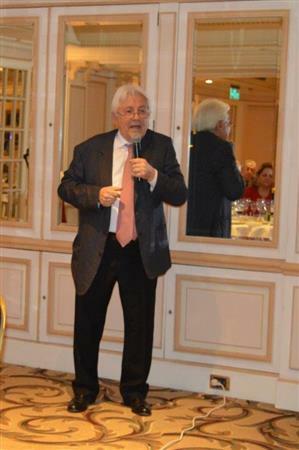 On Tuesday January 16, Rotary Club Beirut Cosmopolitan and Rotary Club de Beyrouth hosted a dinner featuring our guest speaker HE Raya Haffar El Hassan, ex Minister of Finance in Lebanon and currently Chairman- General Manager of the Tripoli Special Economic Zone. The dinner was well attended by Rotarians and distinguished guests who were treated to a very informative and realistic presentation on the topic Economic Development 2017-2018: Highlights and Outlook. "Christmas Event at KidzMondo "
On December 15, 2017 RCBC hosted 78 children from two orphanages : Saint Charbel Baabdate de la Congregation des Soeurs de Saints Coeurs and from the Ecole Immaculee Conception de Saint Vincent de Paul, Beyrouth. "The Relations between Germany and Lebanon"
Joint Dinner meeting between RC Beirut Cosmopolitan, RC Beirut Cedars and the German Embassy in Lebanon. 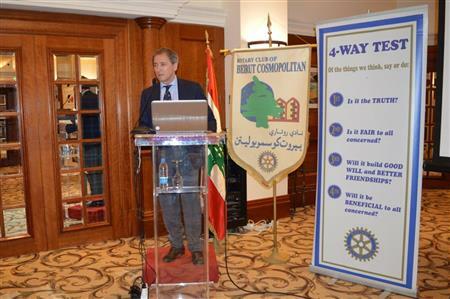 "Presentation and Discussion of the Proposed Association of Rotary Clubs in Lebanon"
Dr. Riad Saade PP of the Rotary Club de Beyrouth, informed RCBC about the objectives and constitution of the Association of Rotary Clubs of Lebanon. 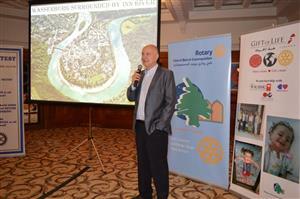 The speech was followed by an informative speech about the Rotary Foundation by PP George Beyrouti. "Emerging Market Companies Rating v/s Country Rating"
Dr. Assem Saffieddine Professor of Finance at AUB explained how companies are rated by external rating agencies and what affects the rating. In addition he explained how the rating can be correlated with the country rating . Dinner meeting on Tuesday November 14,2017 with Mr. Raja A. Makarem, founder and managing director of RAMCO SARL. 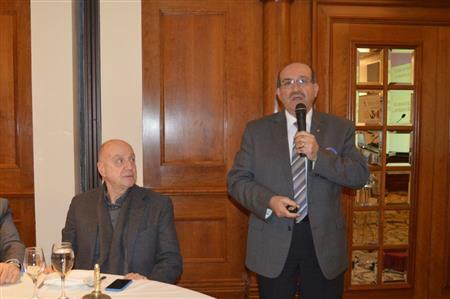 Dr. Nabil Naja (Geriatrics Consultant at CMC Hospital ) Nd founder member and ex president of the Lebanese Alzheimer Association explained to the RCBC members and guests what's Alzheimer. Fellowship meeting with BCRAC members who presented their vision for this rotary year, followed by brief talks on Public Image and the Rotary Foundation. 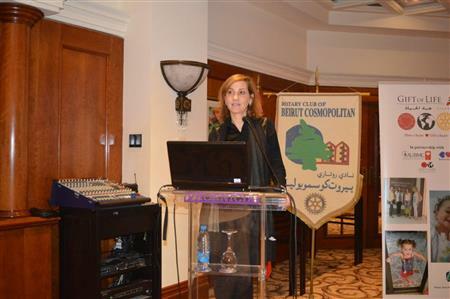 "Increasing Urban Population in Lebanon"
RCBC welcomed Rotarian Aida Cherfan of RC Beyrouth. R Cherfan is the owner of Fine Art Galleries in Lebanon. 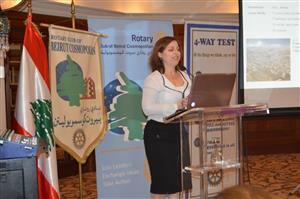 The presentation was delivered to over 67 Rotarians and guests.
" 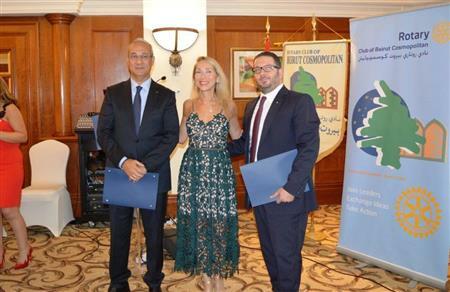 RCBC new members pinning ceremony"
Three new members joined RC Beirut Cosmopolitan: Joelle Feghali, Wael Hamdan and Salah Damer. 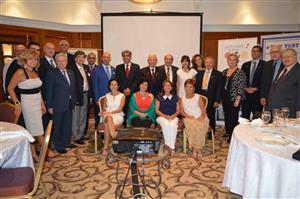 The pinning ceremony took place during the September Dinner Meeting. "Women Empowerment Program in Rural Areas"
By Eng. Ms Rana Chemaitelly founder and CEO of the Little Engineer and Founder of the Lifetime Education Foundation. "RCBC annual orphans Iftar at KidzMondo"
RCBC welcomes visiting guests from RC Wasserburg"
PP Peter Rink from the RC Wasserburg - Bavaria , PDG Dr. Hans Peter Sonnenborn of the RC Pfaffenhofen, and Dr. Maria Fick wife of PDG H G Fick, visited RCBC and talked about the Schneller project that is being implemented in Lebanon. The business meeting was followed by a fellowship dinner. 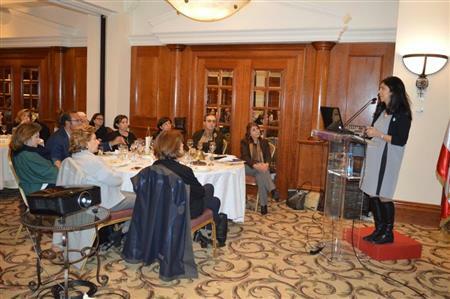 "RCBC at the Gift of Life Gala Dinner"
" Global Compact Network Lebanon"
Dr. Dima Jamali, professor at the Olayan School of Business at the American University of Beirut and Associate Dean for research and faculty development talked about the GCNL (Global Compact Network Lebanon), its mission, goals and objectives. 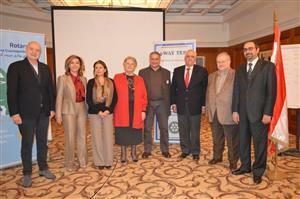 "NGOs in Lebanon and Worldwide"
RCBC Past President Me. 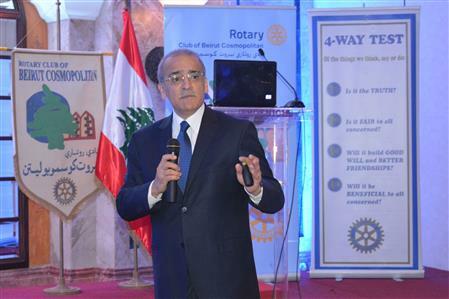 Fawzi Metni -lawyer and Founding and Managing partner of the firm AbouKheir & Metni talked about NGOs in Lebanon and Worldwide, Rotary as NGO, and NGOs and Governments. The speech was followed by P Joe Boulos granting the Paul Harris Fellowship pin to Me. Fawzi Metni. 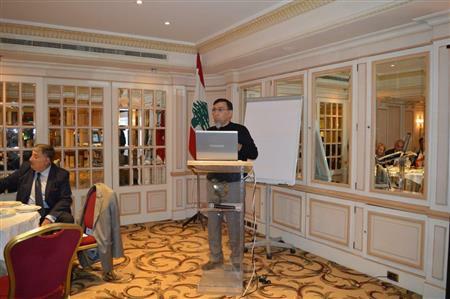 Mr. Walid Maalouf, General Manager of Lebanese Food Bank (LFB) talked about the Mission of LFB to have a hunger free Lebanon by 2020-2025. Studies show that 1/3 of our food purchases is consumed and the remaining is thrown away. LFB collects food from restaurants, caterers, supermarkets and suppliers the excess of food products and distributes it to the poor. "Digital Technology and its Applications"
"Captain Rola Hoteit lands at RCBC"
Captain Rola Hoteit, first and only woman pilot in the history of MEA, was the guest speaker of RCBC. The title of her speech was "Women with Cedar Wings". Captain Hoteit, talked about her beginings as a Pilot, the education she went through, the challenges she faced, the personal satisfaction she accomplished and finally the position and challenges of women in the society. Captain Hoteit surely inspired all the attendees by her accomplishments. "What shaped the Culture of a University"
Rev. Dr. Paul Haidostian president of the Haigazian College talked about the factors that are shaping the cultures of universities. RCBC " Mexican Ladies Night "
Mrs. Amal Harb Film Director and Creative developer talked about her film and project "Hayda Baladna"
H.E. 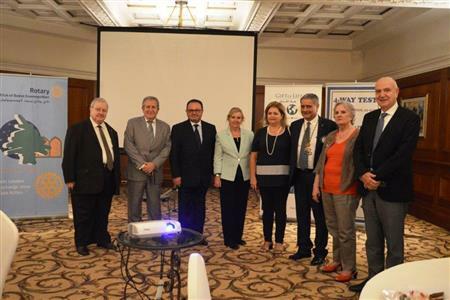 Aftab Khoker, ambassador of Pakistan in Lebanon honored RCBC with his presence during the Club's monthly dinner meeting. 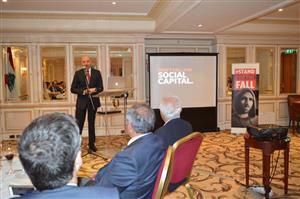 The subject of his speech was:"Pakistan a Newly Emerging Economy, Historical Perspective and Current Challenges:.
" Chateau Musar wine by general director Ronald Hochar"
Mr. Rahed Sarkis, from the Lebanon Echo Movement, discussed the Garbage crisis in Lebanon, its causes, impact of taken measures and appropriate solutions, waste management in large cities v/s in villages. H.E. 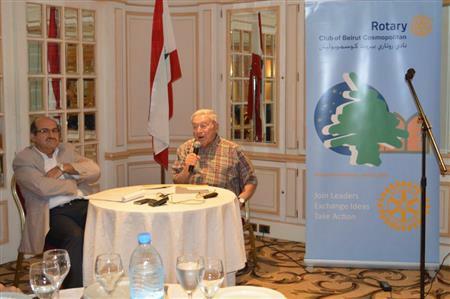 former Minister Fady Abboud, founder of the Lebanese Observatory for Transparency, honored RCBC with his presence during the Club's monthly Dinner meeting. The topic of Mr. Abboud's speech was around " Access to Information act and Tools to fight Corruption" followed by a Q&A session. "Lebanese Red Cross Blood Transfusion Services"
Dr Rita Feghali responsible of the Blood Bank at the Lebanese Red Cross talked about the statistics of the Blood Bank centers in Lebanon, the vision, mission and history of the Center, fast facts, the donation process and the current improvement that is being done for the Blood transfusion services. 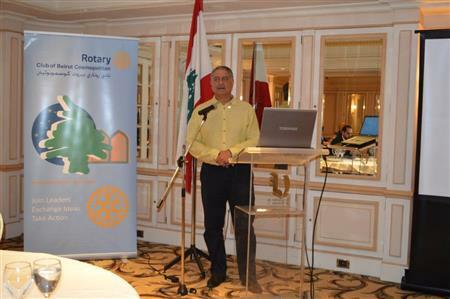 Rt Past President Ronald Farra from the RC of Beirut Cedars informed RCBC members and guests about the Rotary Global rewards program; how the reward system works, how to redeem the offers and how to upload an offer on the website. 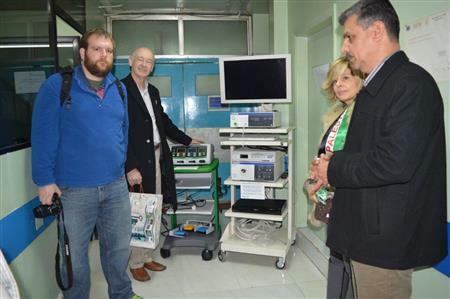 RCBC members, and Rotarians from Lebanese and International Rotary clubs were present during the delivery of the advanced Laparoscopic and Ultrasound Machines to the Haifa Hospital. The hospital serves thousands of patients that cannot afford to pay the medical treatment fees living in underprivileged areas. "Election Reforms in Divided Society and the Case of Lebanon"
On Saturday December 10th. RCBC invited hundreds of orphans coming from different regions, religions and even countries. 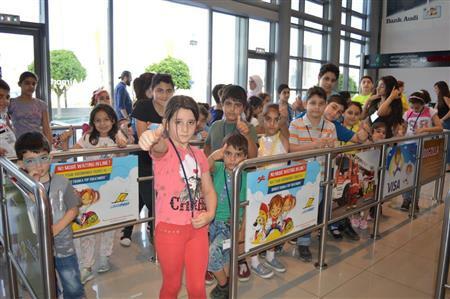 The event that took place at the Teleferic Harissa included the cable car ride, many activities, magician show, games, lunch and finally the distribution of gifts. "Joining our Forces to Protect our Youth"
Mrs Souraya Frem, President and CEO of Cenacle de la Lumiere -a Lebanese NGO with 10 years of service- talked about the achievements of Cenacle de la Lumiere, the addiction recovery programs, their Partners, the available recovery programs, Prevention activities, and campaigns and conferences. 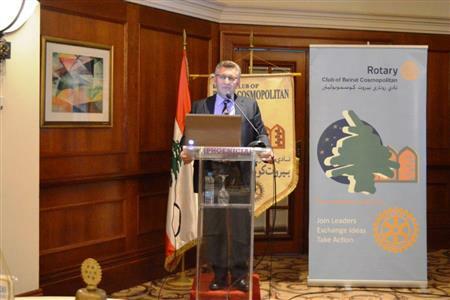 RCBC and RC de Beyrouth jointly welcomed Pr. 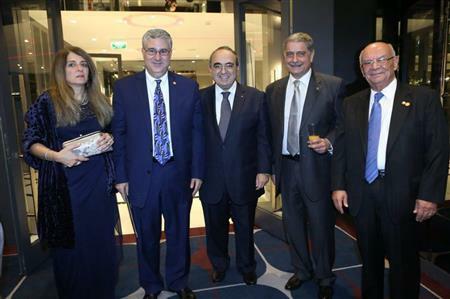 Fadlo Khuri president of the American University of Beirut at their Dinner meeting. Pr. 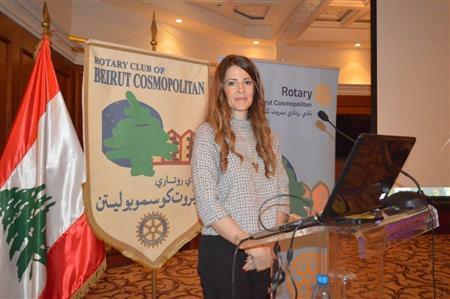 Khuri's speech was entitled "AUB as a Driver of Innovation and Economic Equity"
RCBC Rotarian Silva Guiragossian, talked about her late father, the internationally praised Lebanese Armenian painter: Paul Guiragossian. Silva talked about her father as philosopher, painter and generous contributor to the needy; his inspiration as well as his achievements and international success. Mr. Mohamad Said el Hoss -Head of the Compliance department at Arab Bank PLC- talked about the Compliance culture in Banks. HE Dr. Marta Pizzanelli Ambassador of Uruguay talked about the actual panorama of Uruguay, the bilateral relations between Lebanon and Uruguay, the Influence of the Lebanese Community in Uruguay and an update on Mercosur- Lebanon trade negotiations. 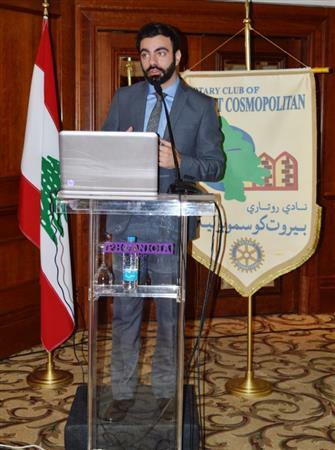 Rotarian Mohamad Baltagi Procurement manager at the Hariri Foundation talked about his impressive achievements. The attendees were impressed by Mr. Baltagi's high level of devotion towards the community and RCBC can only be proud of having Mr. Baltagi among its members. Welcome Mohamad to the RCBC family. Guest speaker Ms. Azadeh Islamy President and Founder of BZ Kidz a non profit youth organization informed RCBC about her NGO and its activities. 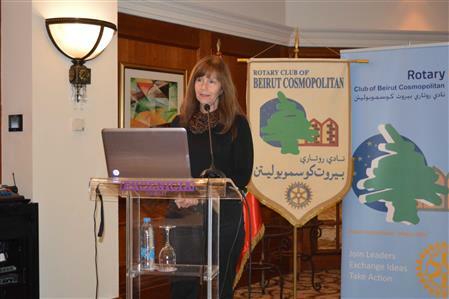 Rotarian Christine Arzoumanian -Certified Wellness coach from Well Coaches- gave a session entitled:"Your Wellness & Well-Being". 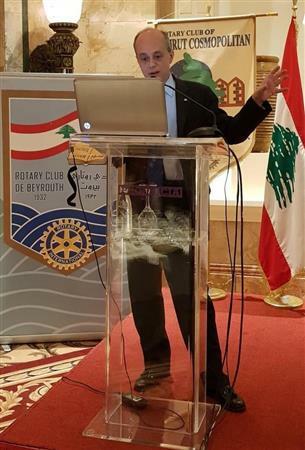 The session was followed by a session by Rotarian Adib Mounla on Risk Management, the challenges that Lebanese Banks are facing with the increasing regulations and IFRS9. 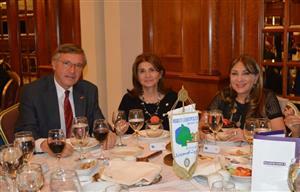 RCBC celebrated the Adha Eid during a dinner event with Rotarians from sister Clubs in Germany. 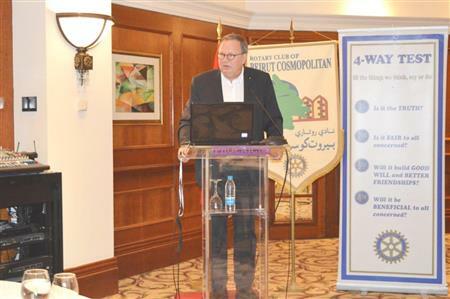 Speakers PP Peter Rink from RC Wasserburg, Prof Dr. Hans-Peter Sonnenborn from RC Pfaffenhofen and Rotarian Krause from RC Friedberg talked about the Schneller School in Lebanon. 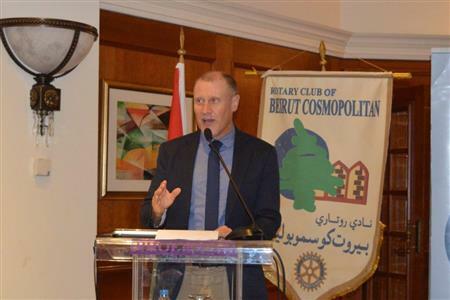 Mr. Andersson International Humanitarian Assistance coordinator (AMURT) informed RCBC how the projects are financed, the activities undertaken on the Lebanese territory, Child friendly space, Psychological assistance to refugees, Art therapy a big step in healing process and Self care for children. At the end of the program children will get a certificate. The NGO worked with 15000 refugees from 3000 families since 2012. 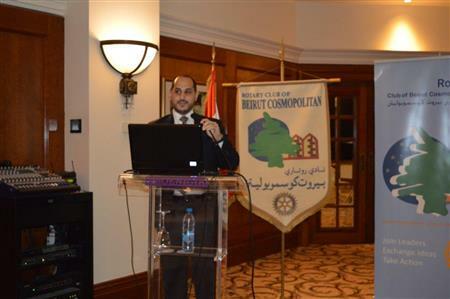 RCBC Rotarian Nadim Hissen talked about his Banking experience during the regular RCBC Classification talk. During the meeting, we had the pleasure to host members from the Rotaract Club of Metn who informed the members and guests about a project that will be held at the Civil Defense center of Dhour el Shweir. Also during the meeting PP John Edde talked about a potential project that can be worked on related to eyes surgeries. Baby Fatmeh was the first baby to benefit from the RCBC Gift of Live Global Grant. 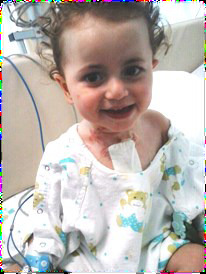 The heart surgery took place at the AUBMC and it was successful thanks to the joint efforts of RCBC, GOL Lebanon and all the Rotary Clubs and districts that have contributed to save children lives. We wish all the best to Baby Fatmeh. 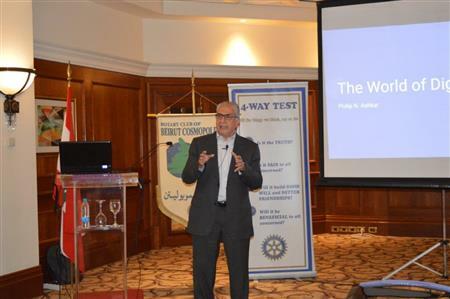 PP Tony Asfour informed RCBC members and guests what is the Rotary Foundation and how Global Grants applications operate. 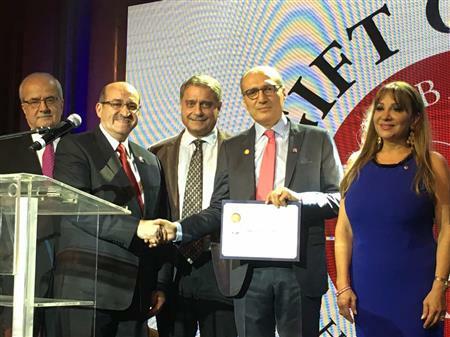 PP Asfour has chaired the Rotary Foundation committee at RCBC for many years and is considered as a reference when it comes to Global Grants and the Rotary Foundation. 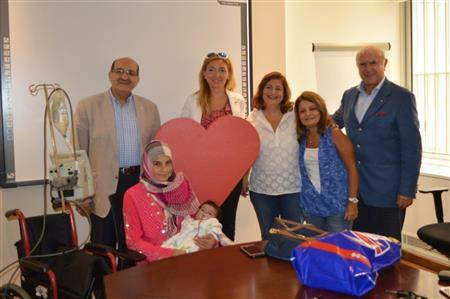 With the start of the new Rotary Year, RCBC handed over the Global Grant check of USD 35,000 to AUBMC Children Heart Center to finance heart surgeries for 7 children with congenital heart diseases. 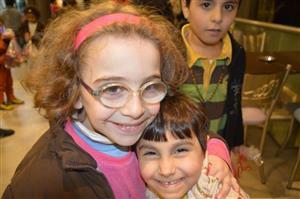 RCBC successful service project of Orphans' Iftar held annually was a very special event this year. 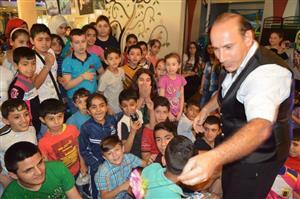 RCBC We hosted 96 orphans / less privileged children from South Lebanon. "I have your Lebanon and I have Mine"
RCBC had the pleasure to welcome Ms Randa Farah, Human Resources Consultant, certified trainer and co founder of Lebtivity.com. Her speech was entitled "I have your Lebanon and I have mine". 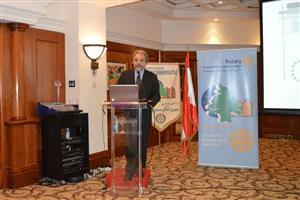 Mr. Peter Yeates CEO of HSBC Lebanon speech was about the Trade Winds Shaping the Future of International Business. First Mr. Yeates informed us how HSBC evolved over the years. Some of the trade winds are : reducing cost of telecommunication and transport, Market opening through trade policy Evolution of company operating models and World propensity to trade Projections. 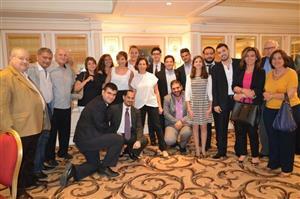 "RCBC Annual Brainstorming session and More"
RCBC's annual brainstorming session was held at the Bustan Hotel. During the session, RCBC members and spouses discussed potential projects that the Club can work on next RY. 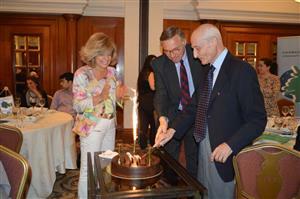 The event ended by celebrating the Birthday of PP Tony Asfour. 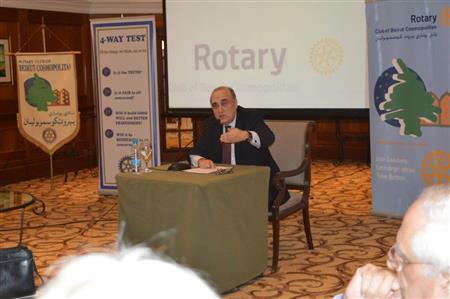 "Emperor of Arts In Lebanon"
PAG PP George Beirouti informed RCBC the resources available on the Rotary International website, how to view Clubs trends and Goals on Rotary Central , how to do Club Business online and available reports Online. 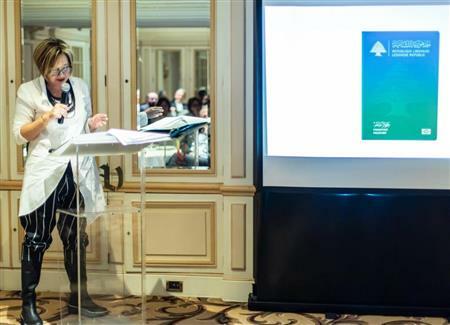 RCBC Rotarian, Diana Cotran, ex executive vice president operations Medicines for Malaria Venture (MMV) Geneva Switzerland, informed RCBC why Malaria is the disease of the poor. 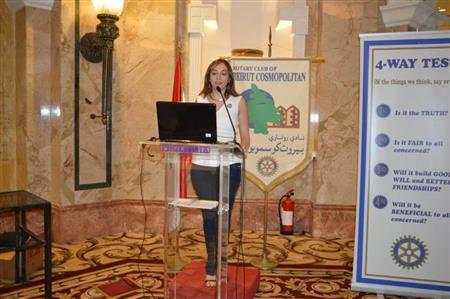 Ms. Lina Khoury " Oum el Nour for Drug Prevention and Rehabilitation"
Ms. Lina Khoury, follow up program director at Oum el Nour for Drug Prevention and Rehabilitation, introduced the Organization to RCBC, and explained the Follow up program, its projections and goals. 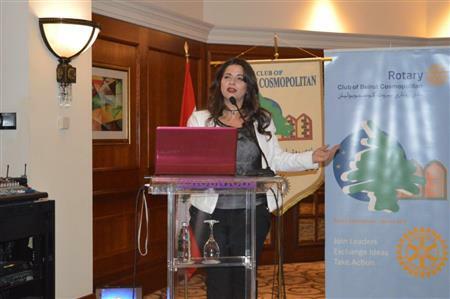 Dr Mona Fawaz urban planning professor at AUB talked about the Beirut madinati campaign, a 10 points program for upcoming municipality elections. Dr. Fawaz discussed the Opportunity for change, the situation of Beirut with congested traffic , unsafe side walks, very small green space. The change can happen through municipality elections. 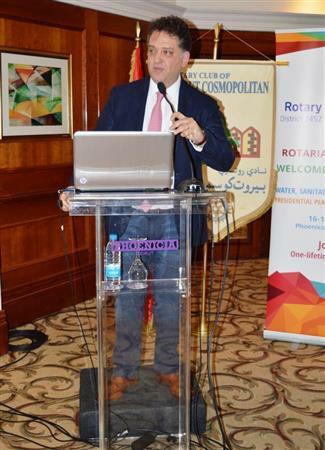 Dr. Elias Aractingi, General Manager at BLOM Bank SAL talked updated RCBC members and guests about the situation of the Banking sector in Lebanon and the Middle East, and talked about the current outlook of the industry. 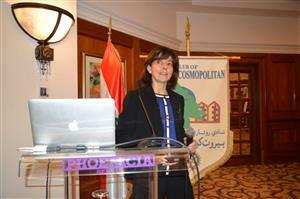 "Globalisation and its Impacts on the Local and International level"
Guest speaker Dr. Marie Line Karam talked about the impact of Globalization, its impacts on the local and international level and future issues. She first defined International law and courts. Then Dr. karam talked about international integration, the modern state system, the concept of sovereignty based on Westphalia, the International court of justice, the International criminal court. She ended her speech by making us wonder if we witnessing the disappearing of the state. 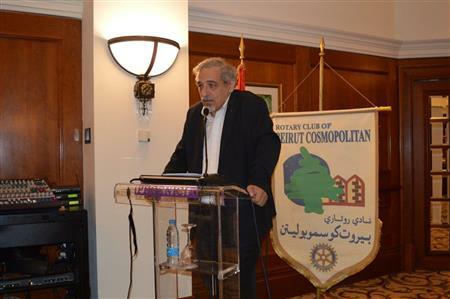 Honorable guest Dr Bilal Hamad's - Mayor of Beirut- speech was about the "Municipality's projects for Beirut: Progress, issues and Future expectations. RCBC President Mimi Hamam appeared on the Future TV talk show "Inter-views" that is a political talk show, hosted by Mrs. Paula Yacoubian, that captures and analyzes the latest political happenings and host the most influential and renowned Lebanese politicians and leaders. 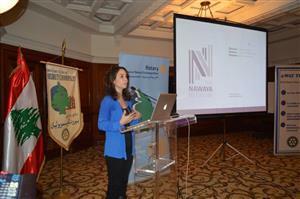 Professor Salma Talhouk informed RCBC about the Beeati Baldati project to study the Lebanese Natural heritage. She went through the goal of project and the methodology used in the conservation. "Palliative care: Dignity and Choice in Advanced illness"
Dr. Hiba Osman, founder of "Balsam" talked about the Palliative care medical approach with an aim to improve the quality of life of patients despite illness, and also the family. There are multiple issues causing suffering, social suffering, spiritual, practical problems, end of life management, loss and Grief. Rotarian Ghaleb Mahmasani "The Parliamentary Electoral Systems: Lebanese Options and Challenges"
"Art and Culture to counter conflict and radicalization in Tripoli"
Guest speaker Lea Baroudi who is engaged in conflict resolution tackled the clash in Tripoli Alaouit section of Jabal Mohsen and Sunni section of Beb el Tebbaneh. Through the March association, Lea auditioned people from both camps to work on a play. Despite a difficult start, all the participants became friends and worked on a play together. Lea shared parts of the play and interviews with the people from the two camps. They left the live of violence and are now writing their own plays. Colonel Marie Abdel Massih of the Lebanon Mine Action Center (LMAC) talked about the structure of the LMAC, its mission, vision,historical overview of the contamination,Clearance till the end of 2015, means used in humanitarian de mining operations, the current situation of mines in Lebanon, information regarding victims since 1975, victims after 2000, the objective of mine risk education, the types of contamination, the kind of mines and how the landmines or cluster munitions explode. 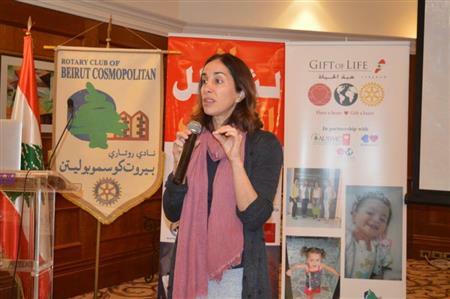 "Rotarian Nada Maalouf Classification and Career Talk"
Rotarian Nada Maalouf, the newest addition to the RCBC family talked about her career and classification as partner at Deloitte Middle East. In her own special way, Rt Nada caught everyone's attention and shared with us her interesting experience at Deloitte. 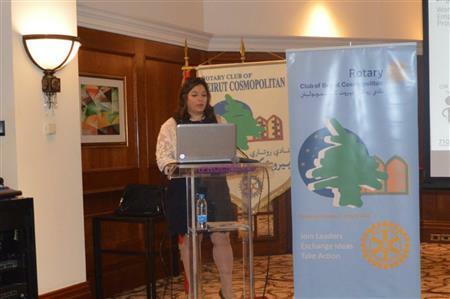 She talked about Deloitte in the world, some facts about Deloitte in the Middle east and in Lebanon,Deloitte by business,Deloitte by industry and sector and Deloitte Retention and advancement of woman in the middle east. Mr. Rami Khoury started his lecture with some thought s about ISIS, and he believes that ISIS will be defeated but the process with take some time. 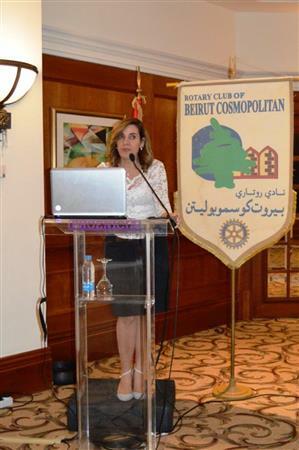 Ms Pascale Hatem expert is knowledge management and founder of "Keel Knowledge Management" explained to RCBC what is Knowledge Management and why it is so important. Ms Hatem defined knowledge management, knowledge, the types of knowledge (explicit, tacit), knowledge activities (socialization, externalization, internatization, combination) and listed the knowledge management benefits and how to use Knowledge management in practice. "Extending Humanitarian Rotary program to Lebanon with RCBC"
Guest Speaker R John Miles - Chariman of the Guilford Eye Project, member of the Leatherhead Rotary Club UK- talked about "Extending Humanitarian Rotary program to Lebanon with RCBC".John Miles is a member of Leatherhead RC and became actively involved with The Guildford Rotary Eye Project almost six years ago. He is a Trustee and was awarded a PHF for his work in serving the avoidably blind. PP George Beyrouti gave a session about the RI elections procedure and rules and regulations. 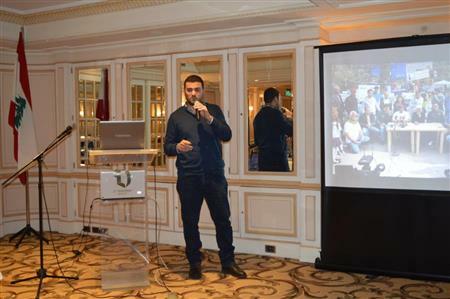 He also talked about the role of the Board of Directors in the Club. The elections were done according to the RI and Lebanese regulations. 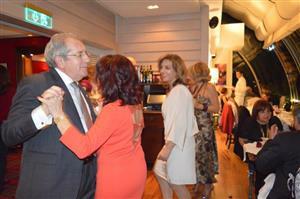 RCBC's wonderful get together Christmas dinner at Sydney's restaurant. Part of the RCBC tradition, the annual orphans Christmas dinner party took place at Laura's Restaurant Harrisa. The Children enjoyed the Magic show as well as many other activities followed by a delicious dinner and gift distribution by Santa. But that was the secondary aspect of the project, as RCBC's main purpose of the project was to remind the Children that they had one big loving and caring family RCBC. 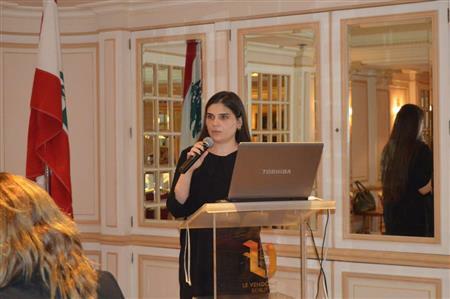 Zeina Saab founder and Executive Director of the Nawaya Network gave a presentation about "Empowering Low-Income Youth to Drive Lebanon's Start-up Ecosystem". 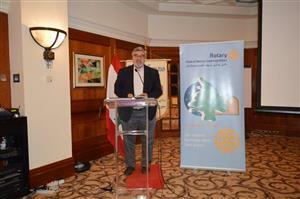 Dr André Sacy - Dental Surgeon- talked about the old town of Saida. First Dr. Sacy informed the Club about the Religious significance of Saida a city that was mentioned on many occasions in the Bible. Dr Sacy shared some old maps that go back to the 19th century as well as pictures of the old walls of the city and the old town, the two old Schools, newly discovered Mameluke and crusaders coins, the Sea castle, Khan Hammoud, Jameh el Barani, Ali Hamoud palace and the Haramlek. A successful dinner meeting during which HE Francois Barras Swiss ambassador in Lebanon talked about "Switzerland, the most innovative country in the World What Lies behind its Success"
"A personal Perspective of the Economical Drives Affecting Geopolitical Decisions in the MENA"
A joint meeting between RCBC and BCRAC during which the Rotaractors of BCRAC talked about the projects they worked on during the first part of the Rotarian Year and the projects they are planning for the second half. Then Mr. Georges Homsi head of Private Banking at the Credit Libanais talked about the Economical Drives Affecting Geopolitical Decisions in the MENA. 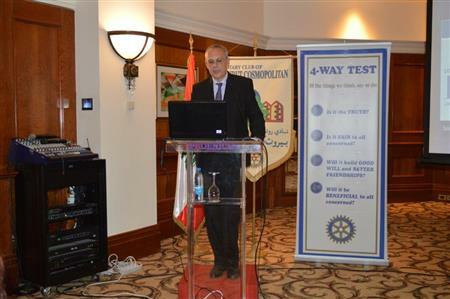 Mr. Raja Haddad talked about the Seven habits of highly effective people and how Rotary can influence the society. There are some levels that people go through going from dependence (on others) to independence and finally interdependence, between them there are 3 habits, vision , listening, synergy. There are leadership levels: personal , interpersonal, managerial, organizational and societal. To become proactive, one should begin with the end in mind, put first things first and always think win-win. Hannes Siebert of Common Space, UNDP- PAF, advisor to the UN common space initiative and facilitator to numerous national dialogues in zones of conflict in the Mena Region and Myanmar, shared his experience in mediation and negotiations. With the increasing number of civil wars there are no more 2 parties involved in a conflict but many parties. Mr. Siebert talked about his experience in the national dialogues of Yemen, South Africa and Lebanon as well as Burma (which is the most complex case he worked on). 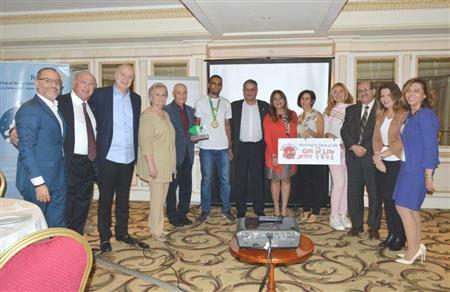 As part of Rotary continuous collaboration with the Children Cancer Center Lebanon, RCBC handed over the Spectra Optia Cell separation machine to the CCCL at the American University of Beirut Medical Center. 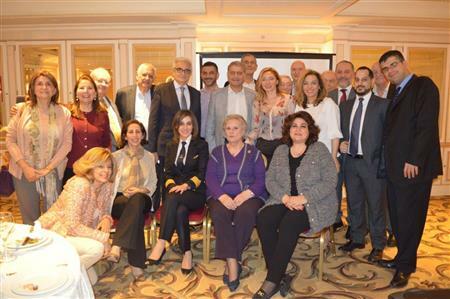 P Mimi Hamam started the dinner meeting with the pinning of RCBC's two new members Nada Maalouf & Nadim Hissen, then PAG and Head of the Banking Control Commission Lebanon Samir Hammoud gave a presentation about the Role of Banks in the Lebanese Economy. RCBC honored PAG Samir Hammoud with a trophy in appreciation to his impressive work to the Lebanese society and economy. 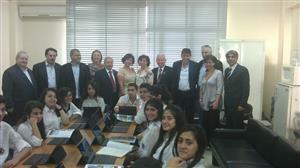 Handover of the Mobile Computer Laboratory to Achrafieh Public High School on Tuesday 6 October 2015 with the presence of DG Naserddine. This project is part of the RI Computer Literacy Global Grant program. RCBC members who visited the Rotary Club of Wasserburg - Bavaria shared their experience through a series of pictures taken during their trip. These pictures alone showed the fellowship and hospitality of our German friends. RCBC was honored to receive a visit by District Governor Mustapha Nasreddine and his lovely spouse, as well as DDG Kamal Katra and ADG Rami Majzoub to its Dinner Meeting. DG Nasreddine met members of BCRAC, RCBC Club President, President Elect and Club secretary, as well as the RCBC Committee Chairs who had the chance to talk about their Committee's programs. RCBC and BCRAC benefited from the advise and guidance of DG Nasreddine. RCBC welcomed Mr. Bob Raylman Executive Director of Gift of Life International (GOLI) during a business Dinner. 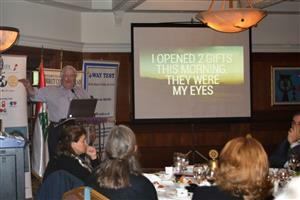 The topic of Mr. Raylman was the historic relationship between Gift of Life and Rotary. The event was very well covered by the media (TV and newspapers). 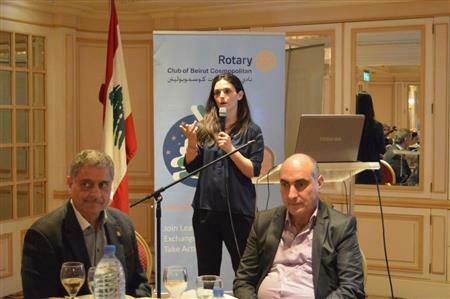 Rotarian Nora Haddad of RCBC showed us how we can solve the garbage problem that Lebanon is facing by sorting the garbage at home. She also mentioned many creative reuse ideas for some items as well as NGOs that are picking up the sorted garbage from buildings. Rt Rana Salhab Membership committee chair, analyzed the results of the survey. 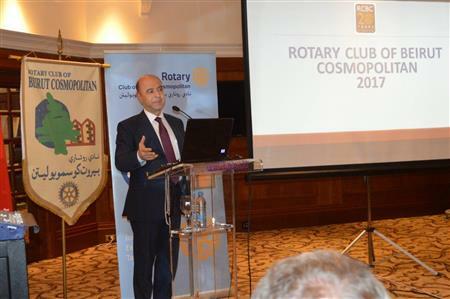 It showed a 78.9% response rate (30 members out of a total of 38) of whom 53.8% are Rotarians between 10-20 years. The survey showed that there is a good level of involvement in activities, there is a need for more news about members on Marhaba, less guest speakers, a need for semi annual surveys and more fellowship projects. 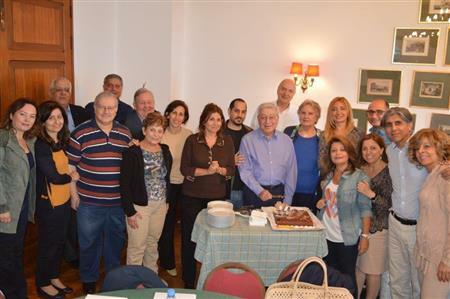 PP Georges Beyrouti went though the pictures of numerous community and fellowship projects that showed how much RCBC has contributed throughout the last 20 years and that RCBC is a Family that will keep growing. 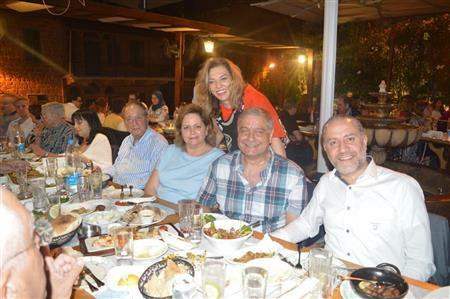 RCBC's annual tradition: an iftar for orphans from different backgrounds at Laura's restaurant Harissa. The event included a magic show by a magician as well as gifts distribution and lots of fun. RCBC arranged for baby Maya from North Lebanon to be operated by Dr. Issam El Rassy, AUB Medical Center, using funds donated by a board member of the Lebanese School for the Deaf & the Blind. She is now back home, playing with relatives and friends. 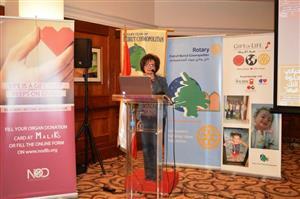 This initiative was part of the Rotarian Gift of Life (GOL) program to assist children with heart defects. Mr. Nour S. Kanafani, a graduate of the American University of Beirut Graphic Design Program and CEO of Communication Design SAL, gave a powerful presentation on the negative influence of social capital and the impact that a proper communication partner can make. 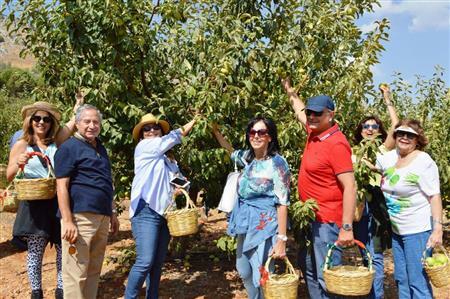 A first of its kind RC handover in Lebanon between two women: P Lina Shair and IP Mimi Hamam who pinned TV Anchor/Host Yacoubian as Honorary RCBC member. 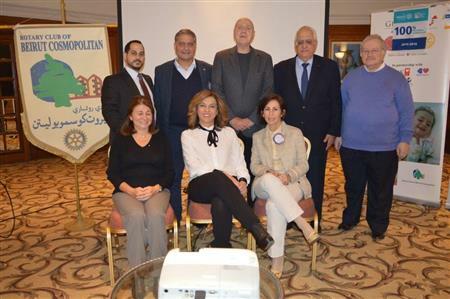 Ms. Yacoubian praised Rotary for its humanitarian work and asked for the support of RCBC in promoting the establishment of a World Bank Hub in Beirut. 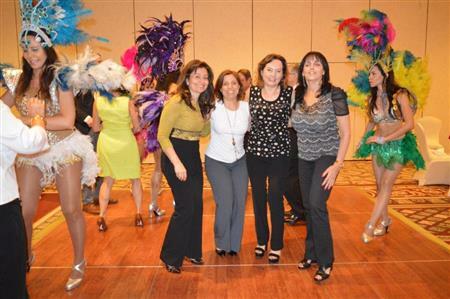 Dancing With the Stars” professionals did a memorable show that inspired attendees to do their best in turn. 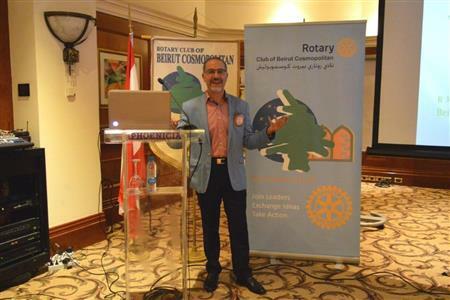 H.E RCBC Rotarian Samir Khoury talked about the Palestinian refugees employment in Lebanon and how it can be a win win situation for both sides. Don Bergman, president of International College talked about the "Invisible kids". First he talked about his professional bacground and how he noticed that there are a lot of Invisible Kids in the school, its Children who feel lonely and dont have friends. 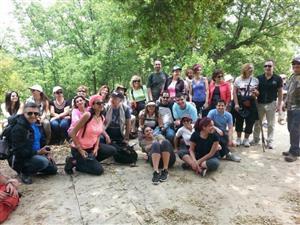 39 RCBC members and guests joined Vamos Todos on their Mazraat el Teffah hiking trip, It was a successful event during which the 160 Vamos Todos hikers knew more about Rotary International and RCBC members showed proved their determination never to give up even on difficult hiking levels. On the occasion of the 100th anniversary of the Armenian genocide, RCBC member R Sona Kurtian gave an informative speech about the atrocities committed in 1915. She started with a historical background information about the geopolitical situation at the time of the ottoman empire and the situation of the Armenian population under the Ottoman rule. R Kurtian talked about the barbaric methods used by the ottomans to exterminate the Armenians and concluded by talking about the increasing worldwide recognition of the Genocide. Finally, R Kurtian finished by saying that she is the grand-daughter of a "Saint" (Armenian Martyr) which dropped more than a tear among he attendance. 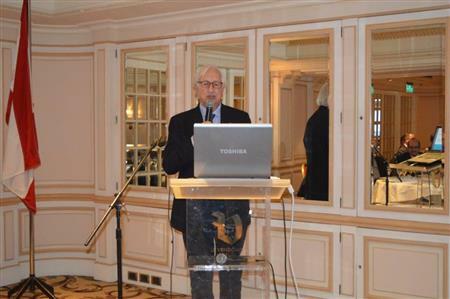 Dr Louis Hobeika described the impact of the Lebanese Civil war and the current regional situation on the Lebanese economy. The Syrian crisis added more problems to the Lebanese economy, in addition to the political impasse and the public debt, with a GDP that is the lowest in the region (1.4%). The country is also facing a problem with the trade deficit. The economic prospect depends on political solutions mainly the end of war with syria to increase exports as well as the problems in the region. 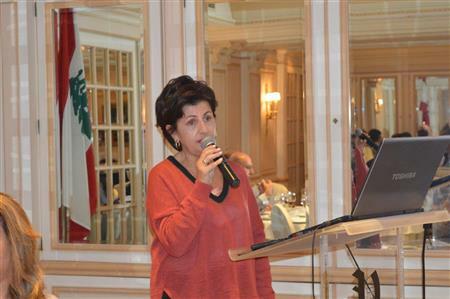 Ms Carmen Chahine Debbaneh President and CEO of CLESS CEMEDE, talked about the education for Special children. CLESS was established in 1999 , its a non governmental and non profit organization that helps children with specific learning disabilities such as ADHD, hyper dislexia, reading difficulties, dysphasia. 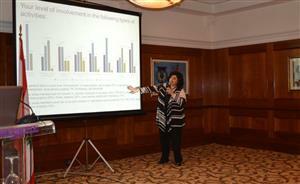 Ms Debbaneh explained how the diagnosis process is done, followed by the treatment methodologies. There are 6 centers in Lebanon, as well as learning support classes. Cless signed a protocol with the Ministry of Education to provide its support for 200 public schools (58 are already operational). Ms. Wazzan (owner and Chief Dietician of Nutrition & Diet Center) started her presentation by talking about the impact of nutrition development on our society, then she explained what is obesity, its causes, trends and the statistics related to obesity. After that, Ms Wazzan explained how our lifestyle changes affected our diet, and talked about the Mediterranean diet program, the progression of nutrition during the last 25 years, the growing demand for dieticians, what is bariatric surgery, eating disorders, diabetic people, the impact of nutrition on the society, career opportunities of the dieticians and future expectations. 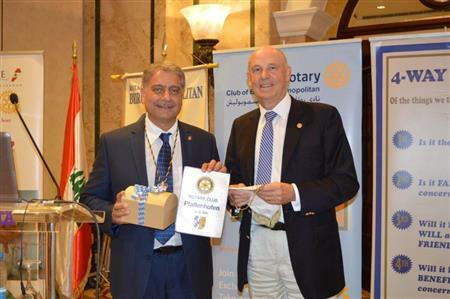 Mr. Charles Ghostine -on behalf of Ksara Winery- received the Paul Harris Fellow Pin from P Lina Shair President of the Rotary Club of Beirut Cosmopolitan. 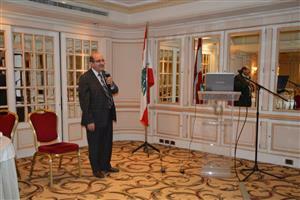 Then Mr Elie Maamari Oenologist and export manager at Chateau Ksara talked about: “Wine in Lebanon : Past & Present”. The 5 Trends are :Virtual reality ( via the oculus rift vr) , artificial intelligence websites , Real time marketing, Happiness marketing, location based marketing. 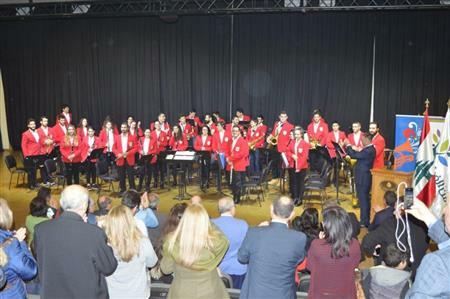 Fellowship event at Al Bustan Music Festival during which the RCBC members and guests enjoyed the concert of The State Youth Orchestra of Armenia playing Paganini’s Concerto No. 5 and Tchaikovsky’s Symphony No. 5 with Soloist on Violin Sergei Krylov and Conductor Sergei Smbatyan. 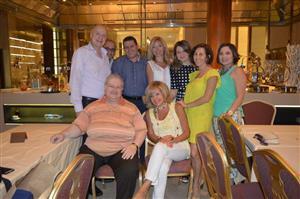 The event was followed at a fellowship dinner at Al Bustan. This project falls under the Water and Sanitation area of Focus. The 5 other areas of Focus are Peace and Conflict prevention/resolution; Disease Prevention and Trearment; Maternal and Child Health; Basic Education and Literacy; and Economic and Community Development. These 6 areas of Focus can be financed by the Global Grants. The Handover of the Water Coolers and dispensers is part of the water filtration project for 17 schools in Lebanon (approximate value USD 44,000). At the RCBC dinner meeting on February 24, 2015, our guest speaker was H.E. Homer A. Mavritommatis, Ambassador of Cyprus to Lebanon. An amazing presentation by Dr Nelly Mouawad about the universe, our galaxy , the origin of life, our solar system and the planets. Dr Fadi Yarak DG of the Lebanese Ministry of Education talked about the impact of Children of displaced Syrians on Public Schools in Lebanon. According to Dr Yarak, each Syrian Student costs around $1660 of which $1500 paid by the Lebanese Government , and part funded by international grants. Dr Yarak also talked about the challenges the Ministry is facing such as the impact of the high quantity of students , the diffficulty of monitoring, health challenges, ngo coordination, tensions between communities, lack of funds, and language barriers. politics that she considers marginalized, partly because of social traditions and partly because of an unfavorable legal system and electoral laws that do not give women a balanced role. Ms. Nadine Moussa criticized the new law relating to physical abuse of women as “truncated” since it omits the points that were considered primordial by women’s Non Governmental Organizations. 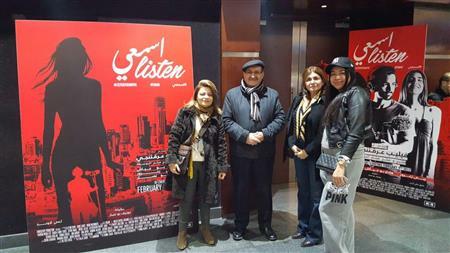 The press gave the Panel coverage in Almustakbal, Alnahar, L’Orient le Jour, Daily Star. One of the most important projects for this year is the Child and Mother Association Global Project. Mrs Aida Ghandour President and Dr Marwa of the association gave Samhoun talked about the services of the association, the challenges they are facing as well as the importance of their work to the Lebanese Society. 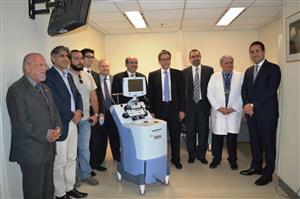 Dr Samhoun also talked about the importance of the machine that will be installed in the association. 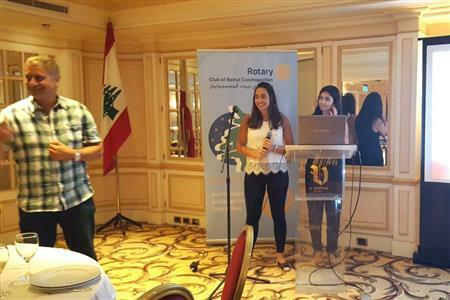 RCBC also received Rotaractors from BCRAC who talked about their experience at the RYLA that took place in November at Ehden Country Club. RCBC sponsored 7 Rotaractors to attend the RYLA. 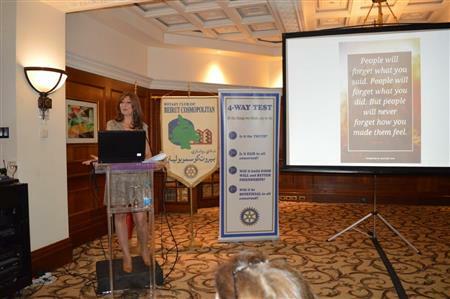 We had the pleasure to receive visiting Rotarian Araceli Suarez from the Rotary Club of Granada - Spain. Rt Suarez talked about her Club and its activities, and challenges they are facing in Granada. This was followed by an exchange of Flags between our President Lina Shair and Rt Suarez. After that, PP Toni Asfour, Georges Beyrouti and Rt Rabab Safieddine were the speakers of a Panel Discussion. Xmas gifts. The children presented a dance and she joined them in "Yalla dabkeh ya shabab". 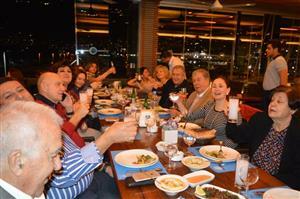 True fellowship spirit at Society Restaurant - Saifi. 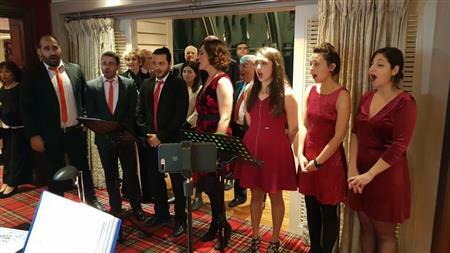 During this event the RCBC members and guests enjoyed an amazing dinner with a live performance. We are already looking forward for the next Christmas dinner. 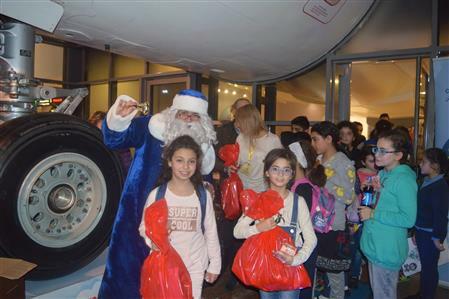 On Friday December 12th RCBC hosted 163 orphans and their supervisors from the following homes : Birds Nest Armenian Orphanage (Byblos), Orphanage of St Charbel (Harissa), Zahrat el Ihsan Orthodox Orphanage (Achrafieh), Catholic Armenian Sisters Orphanage (Bzimar) and Foyer Deir Umallah (Ajaltoun) . 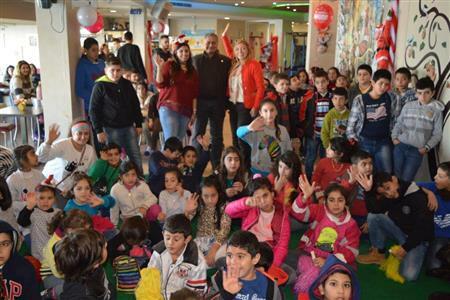 The event took place at the Teleferique food court - Harissa where the orphans enjoyed an amazing show by a magician followed by a warm lunch and finally Christmas gifts distribution. 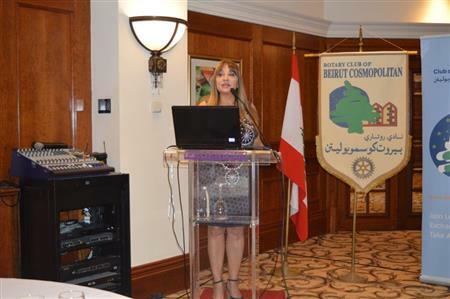 The last couple of months were special to Rt Rana Salhab member of the RCBC, as she received the Paul Hariss Pin on November 25th 2014 and a week later she gave the RCBC a very interesting presentation about the Rotary Survey to Measure RCBC membership satisfaction and views. During this presentation, Rt Rana also gave us a brief about the Monkey Survey. Is ISIS a permanent fixture ? 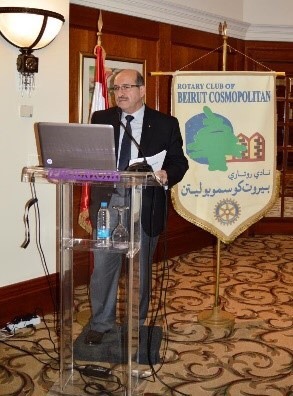 The RCBC was honored to receive Dr Abdallah Abou Habib as guest speaker. Dr Habib talked about the origins of ISIS in the Middle East as well as its sources of funds, and its threats to the region. "Providing Humanitarian Assistance to Palestine Refugees" by Ms. Heli Uusikyla , acting Director of UNRWA - Lebanon. A very interesting presentation about the Foreign Account tax Compliance Act (FATCA) by Mr Gabriel Fernaine (Director of Byblos Bank - Sassine Branch). Mr Fernaine explained what is FATCA, its objectives and requirements. During this meeting we had the chance to meet the members and board of BCRAC and their projects. RCBeirut Cosmopolitan and Rotaract Beirut Cosmopolitan invites you to attend a FAMILY FUN DAY at HARISSA- Teleferique on Saturday September 27, 2014 from 11:00 am to 6:00 pm.Proceeds from this event will go in support of needy ORPHANS. Immediate Past President Mounir Jabre is shown congratulating his successor. Incoming President Lina Shair. 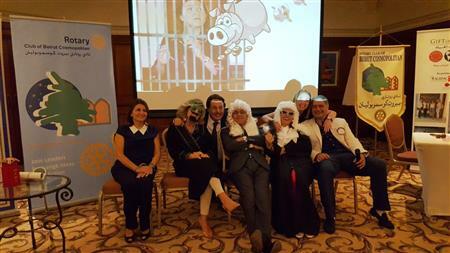 The traditional handover dinner was held at Al Bustan Hotel on June 24, 2014 — a fun evening to celebrate serious things! 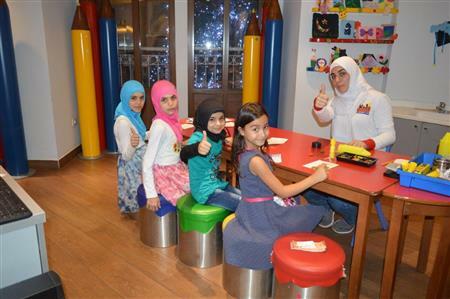 RCBC, in collaboration with Hard Rock Cafe Beirut, invited 135 orphans and their helpers from different orphanages to an Iftar during the Holy Month of Ramadan. 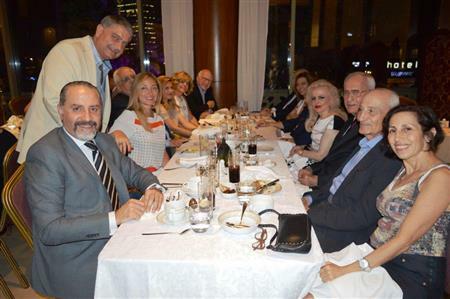 RCBC organized a remarkable fundraising dinner evening at the Hard Rock Café. The “60’s Night” theme drew a large crowd and the enthusiasm of the guests contributed to making the event highly successful. The Rotary Club of Wasserburg, Germany and the Rotary Club of Beirut Cosmopolitan have donated a CNC machine to the Schneller Institute in Khirbet Kanafar, West <?xml:namespace prefix = st1 ns = "urn:schemas-microsoft-com:office:smarttags" />Bekaa of Lebanon. The Rotary Club of San Mateo, the Rotary Club of South San Francisco and the Rotary Club of Beirut Cosmopolitan have donated a gas cooker and a gas fryer to <?xml:namespace prefix = st1 ns = "urn:schemas-microsoft-com:office:smarttags" />the Schneller School. 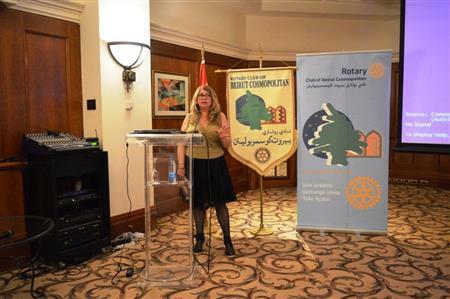 Rotary Land Mine Awareness Project Sponsored by RC Beirut Cosmopolitan, RC LA Cedars, and The Rotary Foundation. 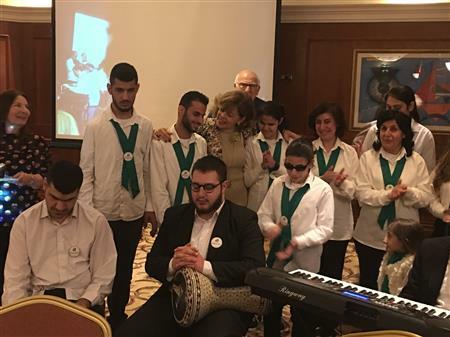 In accordance with its tradition of the last several years, Rotary Club of Beirut Cosmopolitan joined hands with the HRC in Ain El Mreisseh to host around 100 orphans with their supervisors for a Christmas lunch. 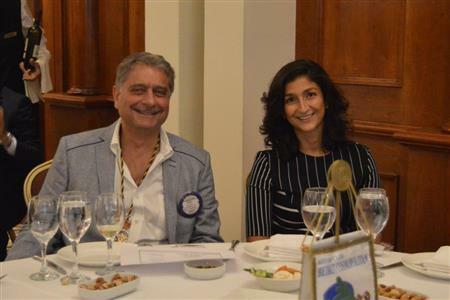 GRSP Student, Christina Asfour visited The Rotary Club of Rockdale County on October 7 and gave a presentation about her homeland Lebanon. 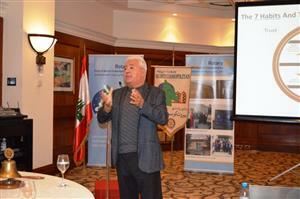 Presentation held on October 14th 2014 entitled "Is the Green Revolution as Green as we wish it were?" The Rotary International organization provided a Nissan X-Trail car for the Mother of God Home for Orphans (Oum Allah Home) in Ajeltoun, Kesrouan, Lebanon. The handing-over ceremony took place on August 24, 2013 at the Mother of God Home in the presence of RCBC President Mounir Jabre, and of RCK President Jean-Paul Finan. 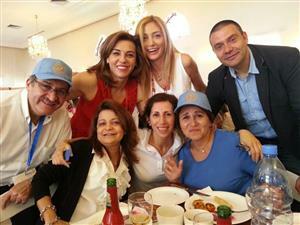 The photo shows a number of Rotarians surrounding Sister Marie Farah, who manages the Oum Allah Home. Immediate Past PresidentAsaad Salhab is shown (RHS in the picture) congratulating his successor. 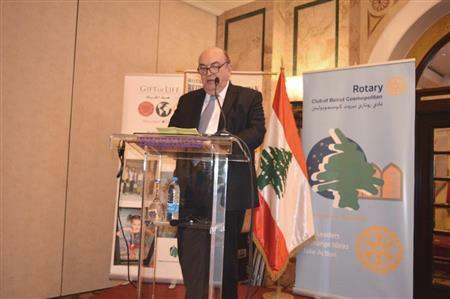 Incoming President Mounir Jabre voiced his commitment to the Rotary Theme 2013-2014: Engage Rotary Change Life. "While the way we do things changes over time", he said, "our core values -- the foundation on which Rotary is built -- stay the same". 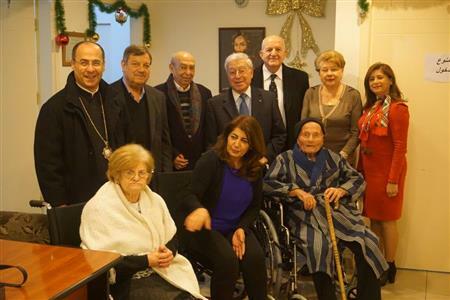 Two Rotary Clubs from Lebanon and another from the US with additional finance by the Rotary Foundation donated an electricity generator and industrial kitchen equipment to Asile Maronite Des Vieillards, a home for the elderly. 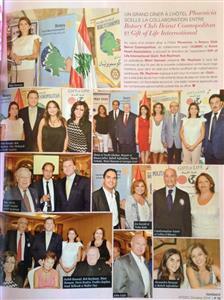 06/07 Ambassadorial Scholar Rima Abou Mrad is still in the US promoting herself and Lebanon. 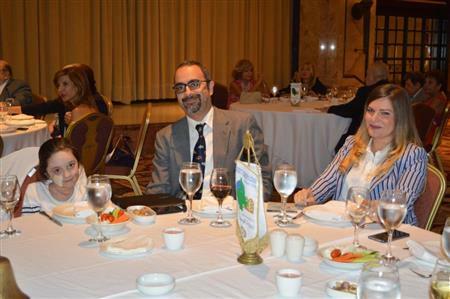 She was recently invited to speak at Rotary Club of Sterling Heights where she made a presentation and showed a movie about Lebanon. RI President Wilf Wilkinson is encouraging all Rotarians to help strengthen Rotary's membership by bringing at least one new member into Rotary. Members of his leadership team who met this challenge have been recognized with a new member sponsor pin.